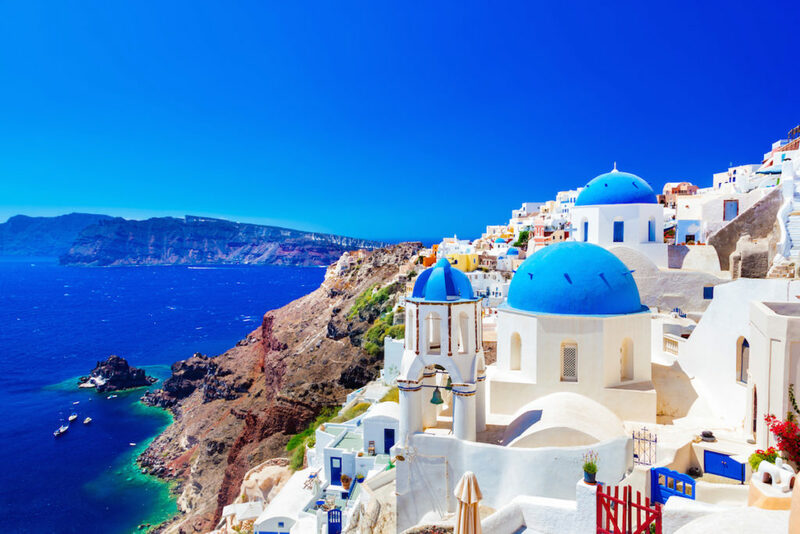 A trip to Santorini can make for the vacation of a lifetime, but there’s a few things you need to know before you head to the romantic Greek island. 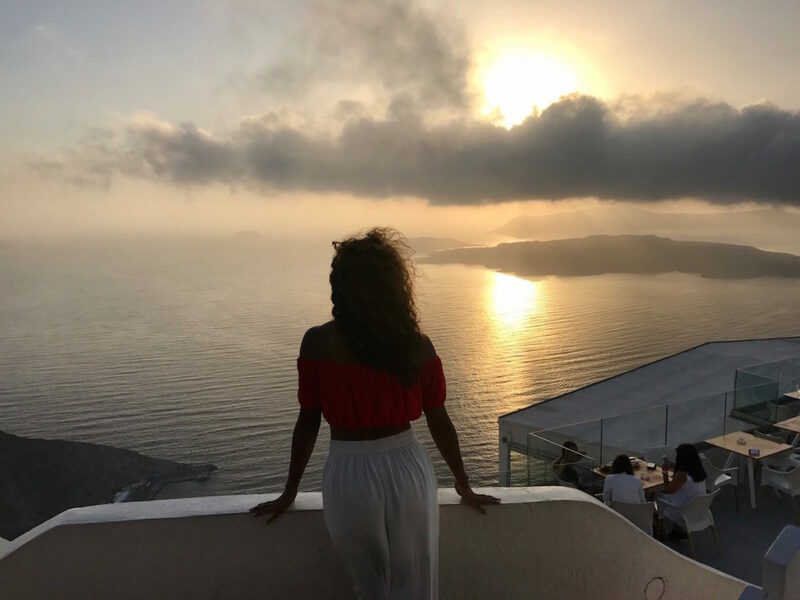 From the best time to go to the app that will change the way you get around town, take a peek at our list of the seven things you need to know before you head to Santorini! 1. Timing Is Everything: If you want to experience the best weather on the island, visit between late June and August – Santorini’s high season and the warmest time there. You’ll be paying more for your hotel/Air B&B during those months, but the weather makes it worth it. If you want to save some bucks, take your trip in March, April, or May or early September. We headed there in late July and had an amazing time. The weather was warm during the day (mid to high 70s °F) and just a few degrees colder at night. 2. There is a Santorini version of Uber: As we mentioned in our Mykonos tips, the Aegean Taxi app is everything. Download it before you head to Greece in case you run into bad wifi. We used the Aegean app a lot in Mykonos, and now it’s available for use in Santorini. It will change the game for you in terms of getting around the island. Once you’re in the different towns though – Fira, Oia, etc. take in the sights and sounds with a walk. 3. Ferry Rides: Santorini does have an airport, but if you’re traveling from Mykonos or a nearby island, taking a ferry is a better (and sometimes the only option). Always go with a high-speed ferry if you do. It is a little more costly, but will save you time and is worth it. We took Hellenic Seaways’ high-speed Ferry (the fastest ferry in Greece) to get from Mykonos to Santorini (about 2 hours) and from Santorini to Paros (about 1 hour). Whether you choose a ferry on Hellenic Seaways, Blue Star or another carrier, go with a first/business class seat if you have room in your budget, go with a first class seat. It’s usually only about 25 euros more per leg and a nice way to step things up if you’re celebrating a special occasion – or just life in general. Big Tip: Bring euros for your ferry ride. There is a cafe’ on board where you can buy light bites (like spinach pies) and drinks (beer, wine, and non-alcoholic drinks) on most ferries in Greece. For some reason, the credit card machine kept malfunctioning on our ferry rides, and those who didn’t have Euros were out of luck. To make your trip even better, pick up a bottle of wine and tuck some snacks and cups in your bag before you get on your ferry to save money and give yourself added convenience. 4. Travel around on ATVs: Hopping on an ATV can be an easy way to get around Santorini, but be careful. We drove ATVs from Fira to Red Beach and then Black Beach, but when it came to driving from Fira to Oia…we skipped that. It has an incredible view, but it’s a longer ride and you’ll be riding along a curvy cliff. It can be dangerous. Also, pay attention and be careful. 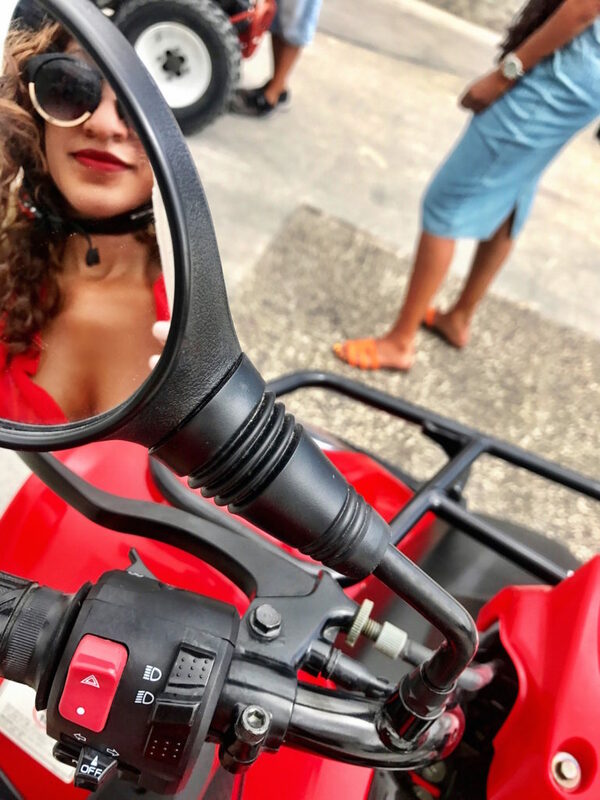 Before you hop on your ATV for your ride, test it out near your hotel with your guide. I did a few test drives to get the hang of it before we headed out into Santorini, but one of my friends did not and we had a light crash into a parked car (no one was hurt…thankfully). 5. Every Santorini Town Has a Different Flavor: Whether you’re staying in Fira, Firostefani, Oia, or another Santorini town, you should know what sort of vibe each one has to offer before you book your stay there. We love romantic Oia for couples and nightlife/shopping hub Fira for girls’ and guys’ trips. Get our full breakdown on the towns and where to stay in Santorini, here. 6. 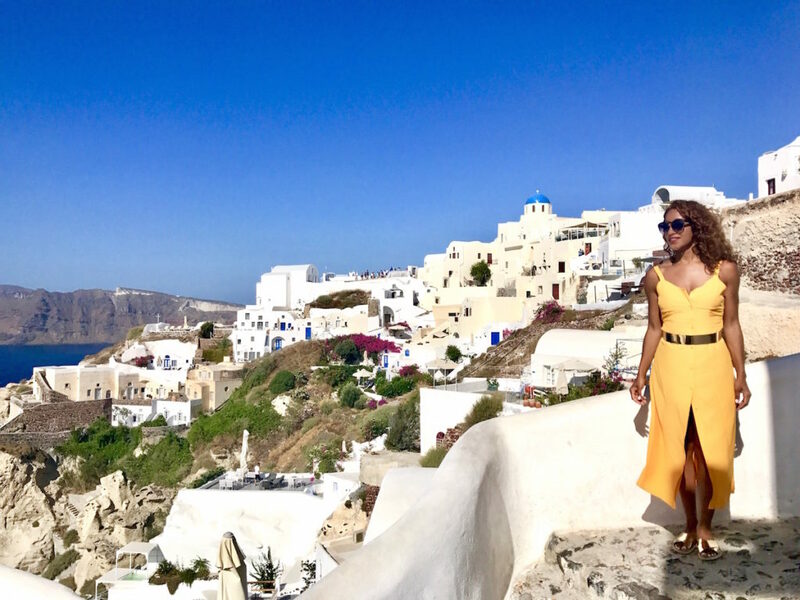 What to Wear in Santorini: Santorini style has an effortless casual chic feel to it. You can pack a pair of (very) low block heels for a special night out, but don’t go overboard. Most of the streets are cobblestone, so leave the stilettos at home. Instead, pack a pair of sandals in a neutral color, as well as metallic and/or embellished slides and flat sandals to add a touch of subtle glam to your look. As for attire, maxi and summer dresses reign supreme, as do colorful rompers and shorts (jean and fabric). 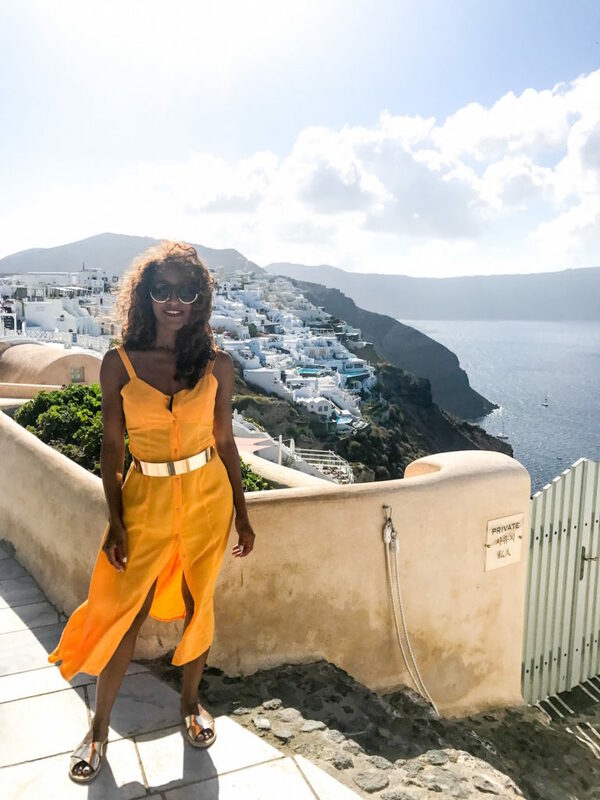 Since the city is drenched in white and blue, wearing bright colors that pop – like yellow (our fave for Santorini) red and orange, can really make a photo stand out. Blues are also cute, but can blend in with some of the doorways. Don’t forget your swimsuits (bikini or statement-making one piece) and cover-ups. If you have an infinity pool at your place, you’ll be spending a lot of time there. 7. What to Do: You should have an idea of the top places to go, wine, and dine in Santorini before you arrive. For starters, check out our full dining breakdown and make reservations for dinner before you arrive, and take a peek at our list of things you must do before you leave Santorini.